Click on "Measurement" or "Time" and choose a topic. Measure your ear, foot and height, enter your measurements and click on "Submit". To watch a clip about area, click on the playlist. Click on "Launch" and follow the activity. Click on the tab "Ingredients" to find the different amounts of ingredients. Enter your weight using kilograms or any unit you wish. Click on the online stopwatch when you think 60 seconds has passed. Use an online stopwatch and think of other time challenges to try. Can you set the time on the clocks? Click on "Celsius", "Fahrenheit" or "Kelvin". Infrared cameras detect heat - the brighter the object, the hotter it is. Can you react in fractions of a second? Tap the screen when the color changes. 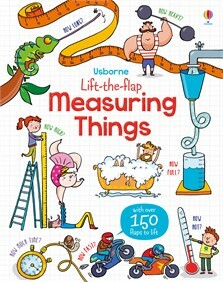 Master all kinds of measuring with this lift-the-flap introduction to time, speed, length, temperature and more. There are speeds to calculate, thermometers to read, and lengths to measure using the handy pop-out ruler included in the book. An engaging introduction to a key early learning concept, with internet links to find out more.